Tour Mackinaw City in Style! 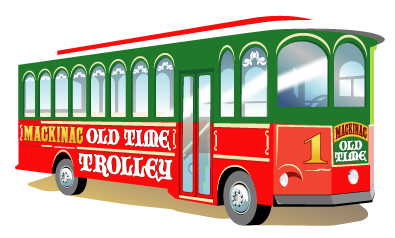 Take a ride on the Mackinac Old Time Trolley and experience everything that the Mackinaw City and Mackinac Area have to offer. Our narrated historical tour is priced just right for everyone looking to see Mackinaw's timeless historical sites, including the Mackinac Bridge,Colonial Michilimackinac, Old Mackinac Point Lighthouse, & the Coast Guard Icebreaker Mackinaw. (1) In the morning, we have a local historical and orientation tour which lasts about one hour for $7.95. (2) We offer a two hour historical tour in the evening which goes over the bridge to a park on the Upper Peninsula side for only $9.95 per person. Times for these tours can change as demand increases or when day light times get shorter. You can purchase tokens for the tour at the front desk of the Mackinaw City hotels listed above, or you may purchase them when you make your hotel reservation online. Bringing a Group or having a Wedding? 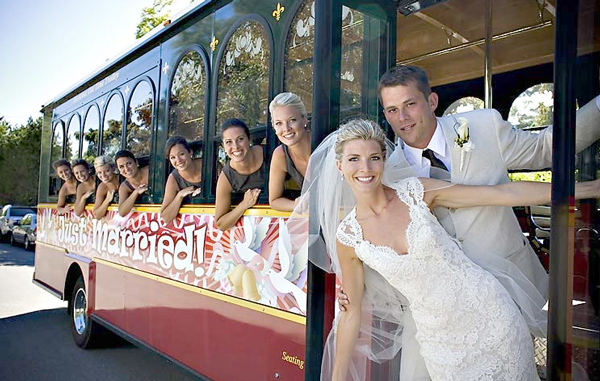 Mackinac Old Time Trolley is perfect for large groups, weddings, & private parties. Contact us at number above to inquire about group rates, and private trolley rentals with a chauffeur!